Special three-day event introduces customers to newly redesigned and customized dining experience. "Food brings people together at home in everyone’s daily lives, and we wanted to reflect that in the new dining experience at IKEA Restaurants,” said Patricia Meumann, U.S. Commercial Manager for IKEA Food. The three-day long event celebrates the re-opening of IKEA U.S. in-store restaurants. Nearly all of the restaurants nationwide are undergoing a full remodel so that customers will be able to enjoy a newly redesigned and customized dining experience featuring three different restaurant zones. 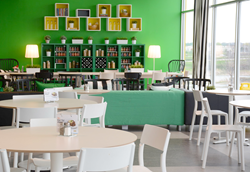 The first area lends itself to a quick bite for the shopper on the run; the second space is family-oriented; and the third section is called “Fika” – Swedish for “to have coffee” – with a living room atmosphere.